Copperhead fever in Atlanta: Can releasing kingsnakes and black snakes chase out venomous snakes? I live with twin 6-year-old boys, one of whom—Alex—is snake-obsessed. Every dream he has, every story he tells, every drawing he makes involves snakes. You can only imagine his joy a few weeks ago when we spotted a gigantic snake in our front yard through the living room window. My reaction was quite different than Alex’s. I did what any neurotic, overprotective mom would do. I ran out the front door, grabbed an elderly gentleman off the street, and dragged him into our living room to show him the snake through the window. 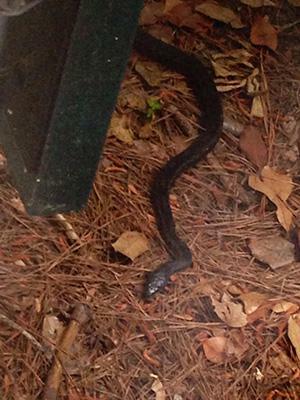 Luckily for us, I learned that our snake—a big one, measuring in at more than 5 feet long—was a black rat snake. The elderly man, John, a neighbor I hadn’t met before yanking him into our home, assured me that our snake was a nice snake, a good snake. In other words, it wasn’t a copperhead. Just a black rat snake. Nothing to worry about. Atlanta, where I live, has been struck with Copperhead Fever. Everyone is talking about the copperheads. Our neighborhood has sent out a copperhead alert on email. Photos and warnings about copperheads are all over my Facebook and Instagram feeds. Copperheads are under the trashcans of friends of friends and in the ivy that surrounds most of our homes. A friend of mine almost stepped on a baby copperhead on her daily walk, and another friend accidentally chopped one in half while pruning her hedges. Copperheads are the topic of the local news, the chitchat at the checkout line, and all the buzz at swim team practice. Honestly, it feels like a plague of snakes around here. Some people are trying to fight snakes with snakes. People in one neighborhood nearby, Druid Hills, which backs up to the Fernbank Forest, imported and released a bunch of black rat snakes into their yards. They hope the snakes will crowd out the copperheads and compete with them for the same food sources. The other day I attended my first-ever snake release party—complete with balloons on the mailbox, a local snake expert, and a kingsnake in a box—right in my own neighborhood after a small child was bitten on the foot while chasing fireflies. This cannot be normal, can it? “Wow—I don’t even know where to start with what’s wrong with that,” he said of the snake release efforts. Yet people in Georgia are scared enough to try it anyway. Carin Jordan, the mother of the little girl who was struck in my neighborhood, felt she had to do something. In addition to removing all the ivy from her yard (ivy’s dense horizontal layers make it the perfect habitat for mice, chipmunks, lizards, and of course—snakes), she invited snake expert and wildlife director of the Chattahoochee Nature Center, Kathryn Dudeck, to her home to release a rescued 4-year-old, 30-inch-long kingsnake, a species that eats copperheads, into her yard. Then Jordan turned the release into a party, hoping to educate neighbors in the process. “I never thought I’d be happy to knowingly have a snake in my yard!” she told me, adding the kingsnake, dubbed “Queen Slinky” by her daughter, was welcome to stay for a good long time, hopefully as an unseen, outdoor pet. Dudeck agrees with Steen that it is typically not a good idea to relocate snakes, but she said this case was an exception. 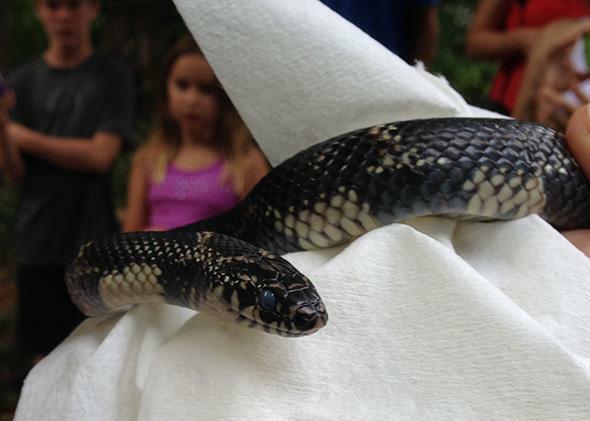 “The Eastern Kingsnake I released came from near the area and was caught in landscape netting in a yard,” said Dudeck. “She was brought in for treatment at Chattahoochee Nature Center’s Wildlife Department. After removing the plastic netting and ensuring there were no lacerations or damage from the constriction, we released her.” She believes Queen Slinky will likely stay close by for the next few years, as long as there is abundant food, water, and shelter. Moreover, he said, there actually are a number of studies that have researched what happens when you translocate snakes. Being unfamiliar with the area causes them to move around more, which makes them more vulnerable to being hit by a car, being seen by a predator, or simply perishing due to environmental conditions. Relocated snakes, he says, have low survival rates compared to snakes that aren’t moved. If bringing in more snakes is not the answer to the copperhead problem, what is? On this, both experts agree. Leave the copperheads alone. Time to get on that—or even better, hire someone else to do it. In the meantime, no more running with bare feet through sprinklers in the grass for my boys. They’ll have to settle on cowboy boots with their swim trunks. It’s OK. It’s Georgia.